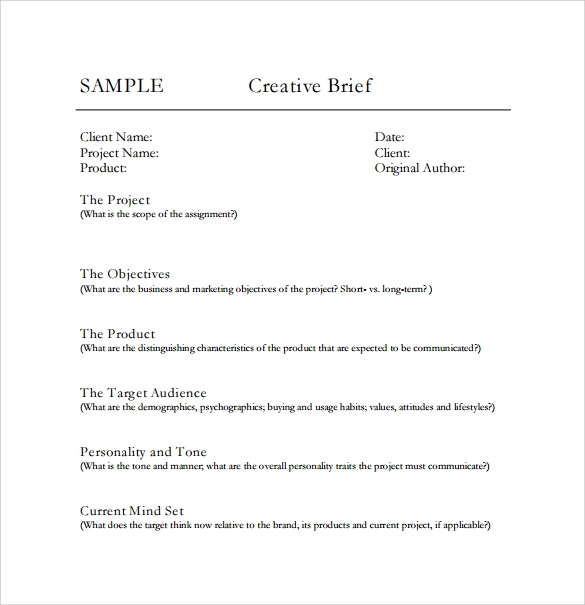 Our creative brief templates are available in Word and Excel formats. These templates are extremely popular amongst many. 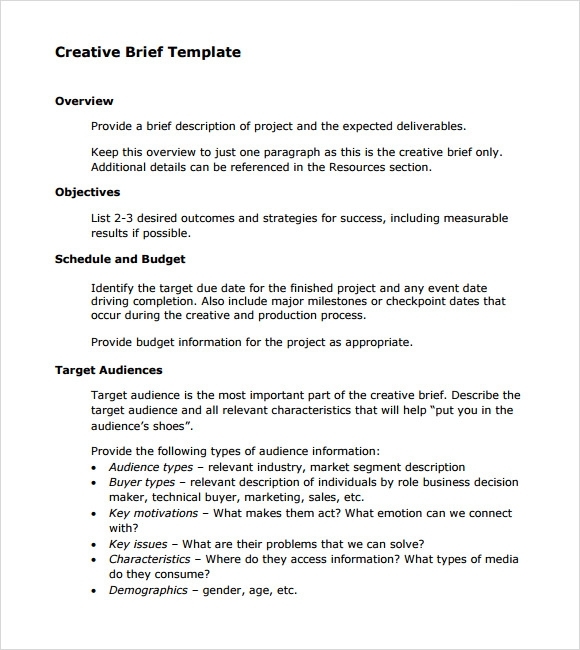 These Project Brief Templates contain relevant and important information such as background, objective, target audience, promise, support for your promise, key message, timing and parameters and other vital data. This particular template is the initial statement of communication between client and project manager. Here the client will be highlighting all his requirements along with the deliverables, branding guidelines, project main objective, a short summary, total budget and contact information. 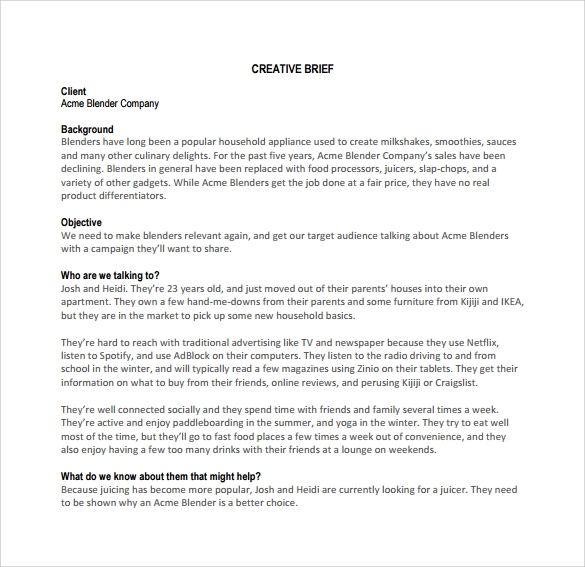 This template is similar to the first one mentioned above but here the client discusses all the requirements in a word document by dividing into different categories. Categories include the project overview, objective, scheduled time duration, final budget and types of target audiences. 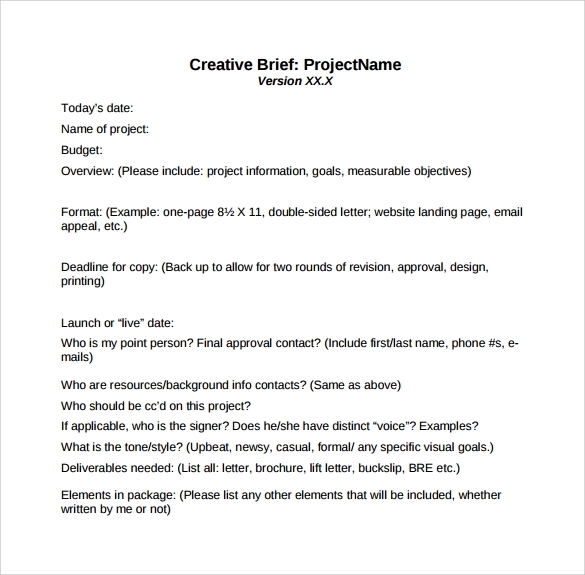 Here, in this template, the client discusses the project requirements by mentioning the name of the project at the top left corner. Even in this template, client explains about their company in the form of a short summary and focus on company background and goal of the project. 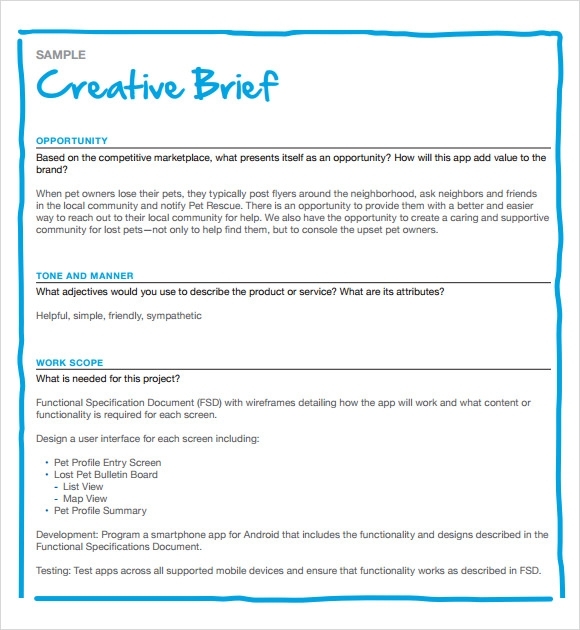 Creative brief free template highlights only the basic project requirements. Here client will focus mostly on the name of the client offering the project, project objectives, company name, an overview of the project, requirements and considerations to be kept in mind before working on the specific project. Are you in need of creative brief templates for designing and advertising the project requirements, then check out here for the top best templates provided for usage. These templates are nothing but a mode of communication between the project designer and client before starting a certain project work and will surely help out to clear all the misunderstandings and wrong spelled requirements before starting the work. By analyzing all the project requirements, we have provided some of the frequently used templates for user convenience. 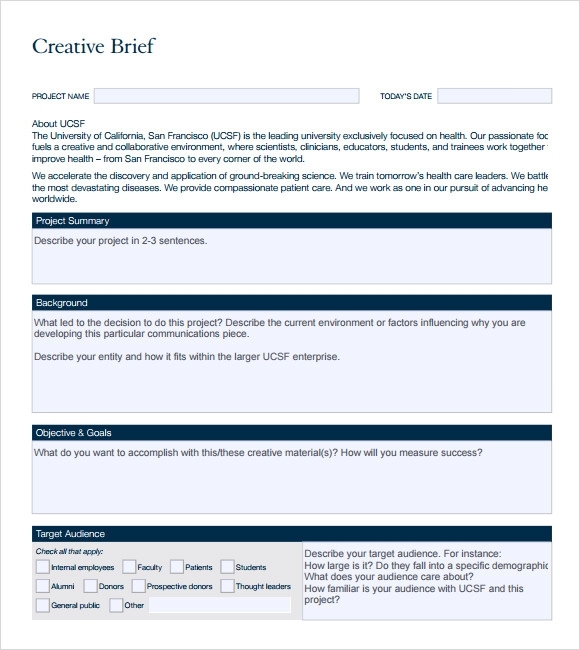 Why a Project Designer and a Client use Creative Brief Templates? Since this business category template is the basic mode of interaction between a client and a project manager, they will be using these templates for sure to expose and discuss the project requirements. These templates are mostly used by the companies to avoid the misunderstandings and errors while working on a specific project. Without this basic template, work would become tough. 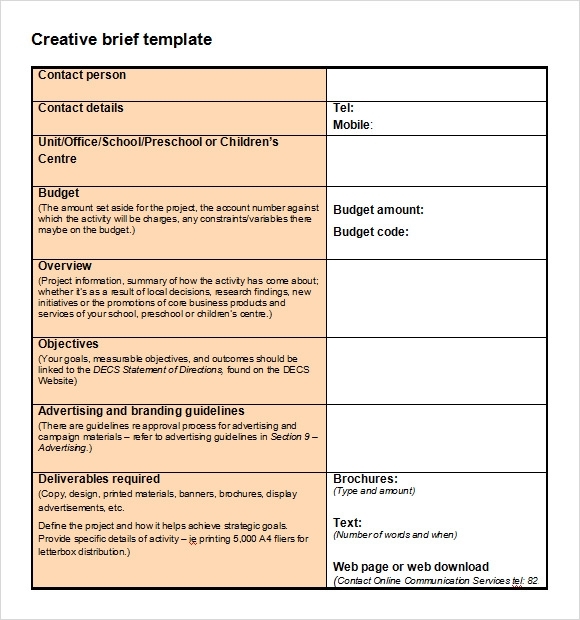 When Does a Client Need a Creative Brief Template? A particular client who is planning to design a project cannot explain the whole requirements just by a single interaction. In such cases, the client will be looking after for creative brief templates which help to explain all the project requirements such as budget, objective, and overview of the project, required software and applications etc., so that even if the client forgets any specification, he can update the list according to the requirements. 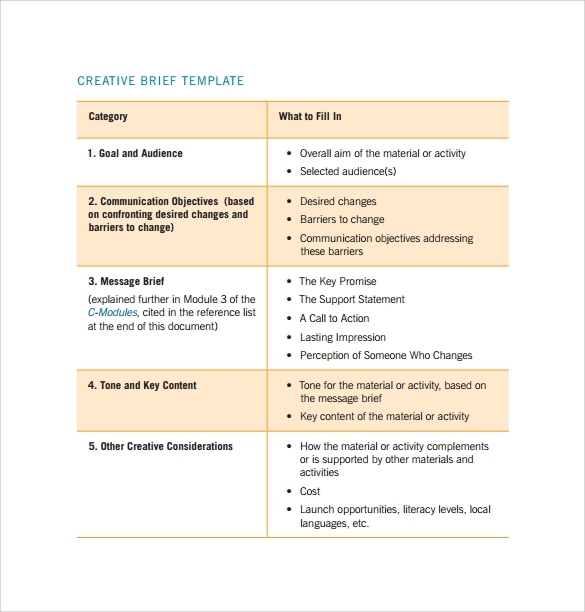 What are the Benefits of Creative Brief Templates? 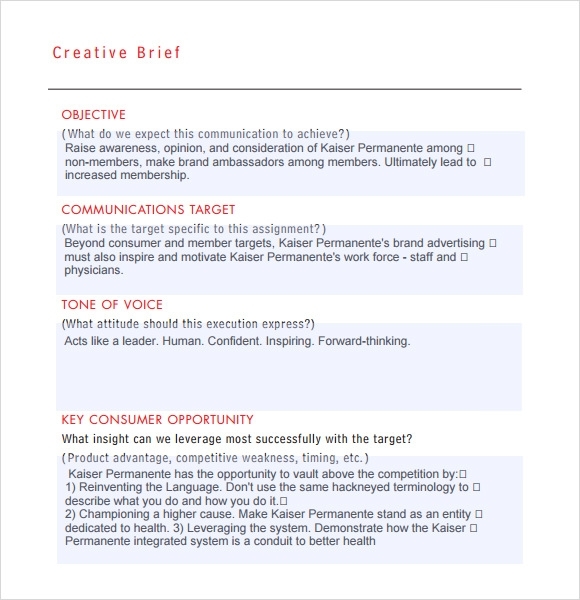 Creative brief templates reduce the risk of remembering all the requirements in mind. The entire work will be done in either word or excel documents. These templates even help the client and designer to keep track of all the requirements and analyze the specifications of the particular project. Without these templates, developing a project would be completely at risk. If you are planning to start a project, then these templates mentioned would be the ideally opted out solution without facing any risks. 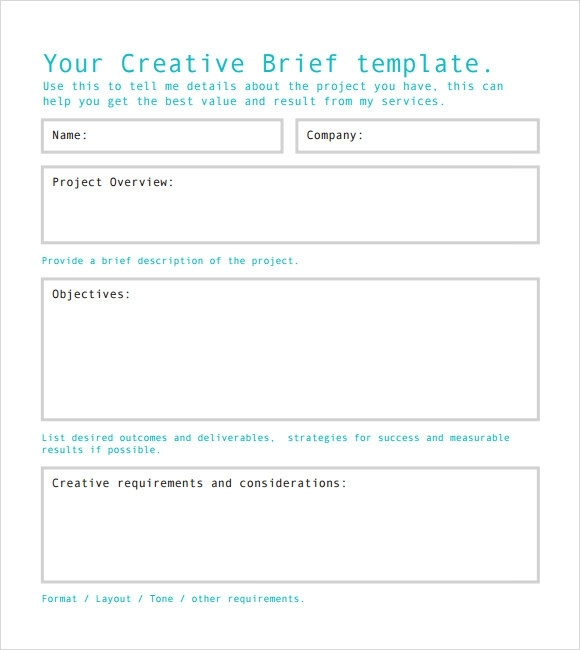 Thus, without these creative brief templates, a project or a design cannot be implemented perfectly. So please do keep on track all these templates as per your requirement and complete your project design without any issues in between. No need to worry! We have listed out here the best templates. You can be confident on us and use these templates for your project objective and requirement analysis. These templates are absolutely free of cost and easy to download. One can print out the downloaded copy of the template and distribute them amongst the team members and prospective readers. These templates are available in a variety of bright and vibrant colors and fonts to choose from. Select the format that suits your specific needs and requirements.